Rimini: large equiped beaches to host every summer tourists that come here by thousand. 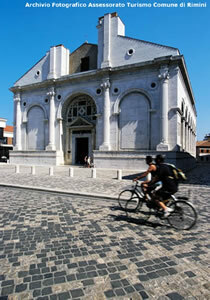 Night-life, gastronomy, Fellini and the sea have made famous this city and his coast. 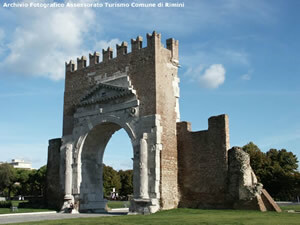 Rimini’s history begins from the beach. Up to 800,000 years ago, primitive man inhabited the coastal area as far back as the hillside of Covignano. From prehistorical times, the road to civilisation passed through the main evolutionary stages, taking Rimini to the forefront of the Roman era. Rimini, which consists of an extensive sea-beach side and an old heart, the town centre, is an open, hospitable and people-friendly city. In the centre, the ancient narrow streets and squares such as Corso d’Augusto, Via Gambalunga, Piazza Cavour, Piazza Tre Martiri and Piazza Ferrari are pedestrian zones and some parts, like the 'old fish market square', are a popular meeting place for young people in particular, who have become even more numerous now that Rimini is an important university centre with over 5,000 students. Near the old stone counters where fish was once sold, trendy bars and pubs have opened turning this charming 'little square' into the heart of 'nightlife' in Romagna. Under the Arengo Palace’s portico, which dates from 1204, justice was administered and the municipal assembly met in the hall with multi-lancet windows situated on the first floor. Next door, is the fourteenth century Podestà residence where the entrance is underlined by an arch with Malatesta symbols. Garampi Palace, which is now the municipal residence, was built at the end of the sixteenth century, modifying the façades of the Arengo and Podestà Palaces. Following an earthquake in 1916, which brought to light remains of the medieval buildings, restoration work was carried out that redesigned the palaces in Neo-gothic style. known as Sant’Agostino church The Agostiniani built the church, which is rectangular-shaped with an apse and two side chapels, in the thirteenth century. The decorations that remain in part consist of frescoes and a wooden crucifix attributed to the fourteenth century Rimini school of art. In the eighteenth century, Ferdinando Bibiena modified the façades and the interior, which was enriched with stuccoes and frescoes by Vittorio Maria Bigari. The fourteenth-century painting was actually hidden and only came to light in 1916 following an earthquake. The Giudizio universale, which is on the triumphal arch, was removed in 1926 and is now housed in the Municipal Museum. As its inscription declares, the arch was built in 27 B.C. as an honorary gate to celebrate Octavian Augustus. It once formed part of the stone-built city walls, the remains of which are still visible, but is now isolated because the adjacent structures were demolished in the 1930’s. The structure, which was originally topped by a parapet bearing a statue of the Emperor, is richly decorated with religious and political references. In fact, the divinities represented in the round shields (Jupiter, Apollo, Neptune and Rome) recall the grandeur of Rome and of Augustus himself. Giotto decorated the Temple, which was built on the site of the 13th century church of San Francesco, and indeed one of his wooden crucifixes is still housed inside. It was conceived by Sigismondo Pandolfo Malatesta as a memorial tomb for his family and although building work began in 1447 it was still incomplete on his death. The temple was designed by Leon Battista Alberti and Matteo dei Pasti and Agostino di Duccio created the bas-relief decorations in the chapels, which highlight the dominant personality of the commissioner who was celebrated by Piero della Francesca in his fresco of the prince and San Sigismondo. The temple, which was recently consecrated a basilica, has undergone restoration work financed by the Cassa di Risparmio di Rimini Foundation. Its completion, in Jubilee year, returned the marble and bright colours of the interior chapels to their former splendour. Building work on Sigismondo Malatesta’s residence-fortress began in 1437 and lasted around 15 years. Today, unfortunately only the central nucleus remains. The castle appears on numerous Malatesta medals as well as on Piero della Francesca’s fresco in the Malatesta Temple where it is depicted with towers, walls, a wide moat and an imposing keep. On the inscription at the entrance, Sigismondo claims responsibility for the building ex fundamentis, but it actually incorporated several older buildings. In the 17th century, the building became a Papal fortress and was then used as a prison until 1967. Nowadays, it is the prestigious venue for numerous cultural events. The heart of medieval Piazza Cavour is the fountain, which also features in the painting of the city housed in the Malatesta Temple. Even Leonardo da Vinci was enchanted by the harmony of the waterspouts when he passed through Rimini in 1502. Giovanni Carrari from Bergamo restored it after damage caused in 1540 by fireworks placed in the tub to celebrate a high prelate lending it its present shape, which respects the original ancient layout. A statue of Saint Paul once crowned the fountain but was replaced in the nineteenth century by the 'Pigna' (pine cone) that gives the fountain its name. As the inscription on the internal parapets recalls, work on the bridge over the Marecchia River, then known as Ariminus, began under the Emperor Augustus in 14 A.D. and was completed under Tiberius in 21 A.D. The bridge still connects the city centre to Borgo San Giuliano and leads to the consular roads Via Emilia and Via Popilia that lead north. Built in Istria stone, the bridge consists of five arches that rest on massive pillars with breakwater spurs set at an oblique angle with respect to the bridge’s axis in order to follow the current. The bridge’s structure on the other hand, rests on a practical system of wooden poles. The Amphitheatre, which dates from the second century as a coin of the Emperor Hadrian found buried in the walls testifies, was situated close to where the coast once was. It was originally a sombre brick structure, consisting of two superimposed orders with a colonnade of 60 arches. It was an extremely impressive sight, particularly when approaching from the sea. The Amphitheatre was elliptical-shaped and measured 117.7 x 88 metres while the arena was 73 x 44 metres wide, almost the same as those found in the great amphitheatres. Gladiatorial events held here drew at least 15,000 spectators at a time. Fellini Park, situated just next to the Grand Hotel, is the very heart of seaside Rimini. This is where the first bathing establishment was set up in 1843, commissioned by the Baldini Counts and Dr. Claudio Tintori. This health-conscious vocation developed thanks to the well known professors Paolo Mantegazza and Augusto Murri and in 1872, a new bathing establishment was built named Kursaal (it was destroyed in 1948). The layout of the city began to change with the construction of a new road, now called Viale Principe Amedeo, to connect the old city centre to the marina. The twentieth century saw a move to a more elite tourism and 1908 was a particularly symbolic date as it marked the opening of the Grand Hotel, a strong source of inspiration for Fellini. 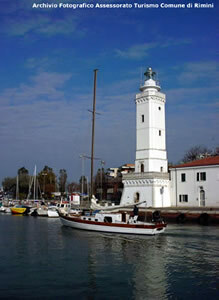 Before becoming the European holiday capital, over the years Rimini was an extremely important port. Nowadays, the port’s 'pile trestle' is the most popular place for Riminese to take a walk. It evokes pleasant memories and is the kingdom of sailors and fishermen, watched over by the lighthouse and ploughed by the ‘poveracciaie’ (boats equipped for clam fishing). From dawn to dusk, throughout the day the port gives visitors the sensation of diving into the sea and affords spectacular panoramic views dotted by the thousands of colours of the bathing establishments that have made our beach famous throughout the world. On the left side of the port is the new wet dock 'Marina di Rimini', a great masterpiece that opened in 2002 and can host up to 680 boats. Overlooking the marina are ultramodern hotels, some of them 'signed' by great international architects. Running parallel to the promenade is Via Vespucci with its bars and fashion boutiques. The entire Marina Centro area is famous for its bars where young people meet for an aperitif, its trendy pubs and disco bars and its restaurants serving truly memorable menus featuring local produce and in particular, the staple diet or in other words fish, which is cooked on the characteristic grills or in excellent soups. Ruby-red Sangiovese, the typical wine of Romagna, 'sky blue' fish from the Adriatic and golden, ground grain, an indispensable ingredient for making ‘piadina’ Rimini’s daily bread. These are the basic colours of local cuisine, the colours of the great food festivals held day and night in Rimini, 365 days a year. 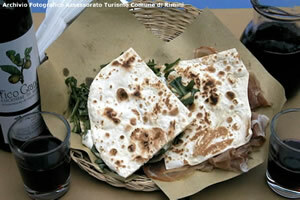 You will find piadina everywhere, in roadside kiosks and beach restaurants, in the many piadina restaurants dotted everywhere, in taverns and trendy restaurants and now even on the virtual highways of Internet where a pinch of the flavour of Romagna is on sale. This is simple cuisine based on seafaring and country traditions but it does not disdain a little imagination in the preparation of dishes. Food ranges from hors d’oeuvres, which are either sliced cold cuts served with warm piadina (made using flour, lard, water and salt) that is even better if served with squacquerone (a soft cheese that literally melts in the mouth) or fish followed by a great variety of pasta dishes, which are always handmade by the arzdora (housewives). Try tagliatelle, cappelletti (small pasta parcels), ravioli and strozzapreti (literally 'priest stranglers') served with meat sauce or clams. Main courses vary from char-grilled meat (the lamb is excellent), to spit-roasted rabbit accompanied by side dishes of vegetables au gratin, to grilled fish (the famous 'rustida'), fish kebabs and fried fish. All the dishes use extra-virgin olive oil from the hills behind Rimini (one of the best in Italy due to its acidity level and also its organoleptic characteristics) and are 'watered' by Sangiovese red wine or by Trebbiano white wine, both typical wines grown on the hillsides of Romagna.